Good to see that you can still have fun in the late years. The internet is flush with these ‘coney island with bowler hats’ photos. They are performing together on Broadway, acting in Harold Pinter’s No Man’s Land and Samuel Beckett’s Waiting for Godot. Seems they have really taken to Twitter. After all those years with: “Earl Grey. Hot”, guess sir Patrick, has a lot of caching up to do. Oh man, what I wouldn’t give to be a “fly on the wall” during some of their conversations! 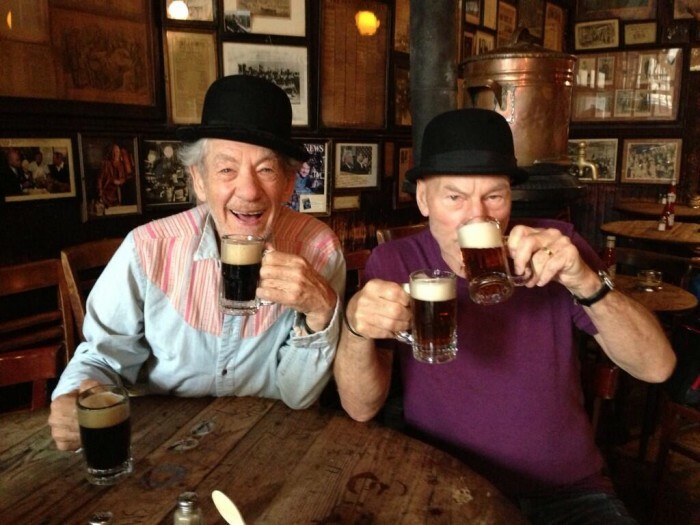 Just two actors having fun during their time on London’s West End stage performances of the Samuel Beckett’s “Waiting for Godot”.